When you clean mold and mildew, you can make the clean last longer with Mold Armor® Mold Blocker. Mold Armor® Mold Blocker provides protection from mold and mildew staining when properly applied. 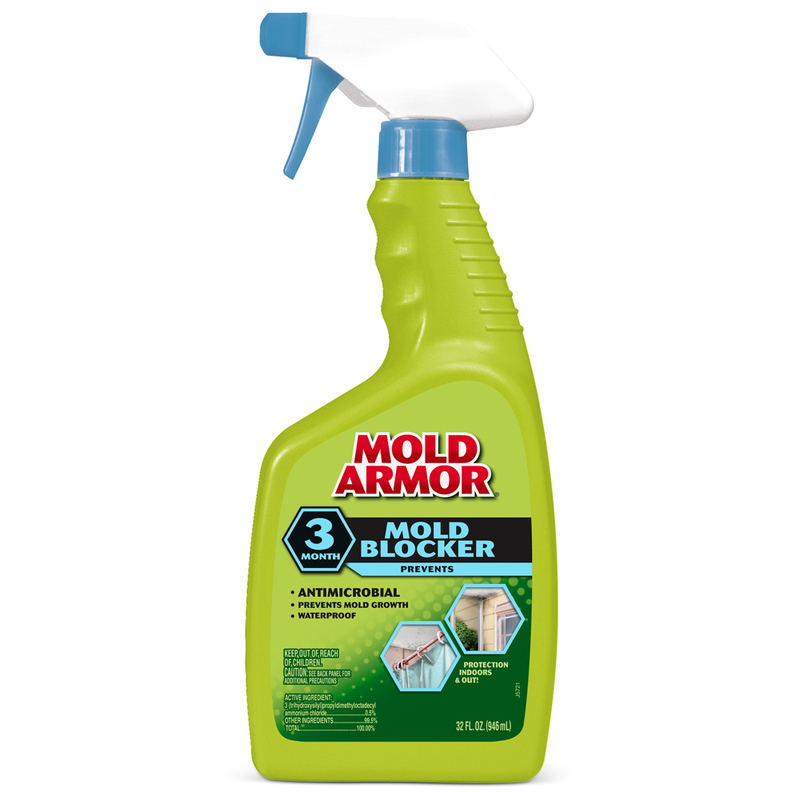 Mold Armor® Mold Blocker establishes a barrier between most household non-porous surfaces and bacteria and mold and mildew that cause odor, staining, and discoloration. It's a water-resistant anti-microbial and odor-free product that provides protection indoors and out. ONLINE ORDERS SHIPPING NOTE: Alaska and Hawaii orders ship Standard Overnight or 2-Day Air only. Bathroom and Non-Food Contact Kitchen Surfaces: Tubs, glazed tiles, vanity tops, shower curtains, shower stalls (areas), sinks, washable walls, wallpaper for non-food contact, floors, window sills, cabinets, garbage cans, exteriors of appliances, refrigerator exteriors, fiberglass, Formica, glazed porcelain, synthetic marble, plastic vinyl. SPRAY: Shake well. Using trigger pump sprayer, spray entire surface area 4”- 6” from the surface making sure the surface is completely covered. Let stand until dry or let stand for 3 minutes and wipe dry with clean cloth or sponge. If spotting occurs, wipe with moist cloth or sponge. If necessary, reapply every three months or when odor, staining, and discoloration due to bacteria, mold stains, or mildew stains return. Linens, Draperies, Fabric and Apparel: Bed sheets, blankets, bedspreads, curtains, draperies (washable only), underwear, socks, intimate apparel, hosiery, throw rugs, toweling, toilet tank covers, shower curtains, shoe insoles, outerwear apparel (jackets, sweaters, sweatshirts, coats, raincoats, overcoats, jerseys, ponchos), and fabrics made out of acetates, acrylics, cotton, fiberglass, linen, Lycra, nylon, orlon, polyester, polyethylene, polypropylene, rayon, silk, spandex, vinyl, and wool. SPRAY: Clean surface prior to application. Shake well. Using trigger pump sprayer, spray entire surface area 4”- 6” from the surface making sure the surface is completely covered. Let stand until dry or let stand for 3 minutes and wipe dry with clean cloth or sponge. If spotting occurs, wipe with moist cloth or sponge. Test for staining and color-fastness of fabric by treating and drying a small, concealed area prior to application. If necessary, reapply every three months or when odor, staining, and discoloration due to bacteria, mold stains, or mildew stains return. SPRAY: When treating filters, remove filter from unit. Shake well. Using trigger pump sprayer, spray entire surface area 4”- 6” from the surface making sure the surface is completely covered. Let stand until dry. If spotting occurs, wipe with moist cloth or sponge. If necessary, reapply every three months or when odor, staining, and discoloration due to bacteria, mold stains, or mildew stains return. Carpet: SPRAY: Apply to clean carpet. Shake well. Using trigger pump sprayer, spray entire surface area 4”- 6” from the surface making sure the surface is completely covered. For rotary jet extraction cleaners and carpet steamers, add product directly to cleaning tank, then operate the equipment in accordance with manufacturer’s instructions. Apply and then let stand until dry. If spotting occurs, wipe with moist cloth or sponge. Test for staining and color-fastness of fabric by treating and drying a small, concealed area prior to application. Mold Blocker treats approximately 200 sq. feet per gallon. When treating coarser substrates (e.g., wool carpeting), more Mold Blocker may be required due to absorption. Dry carpet areas and surfaces before re-entry. A fan may be used to assist in drying carpeting. Remove children and pets from treated area until completely dried. If necessary, reapply every three months or when odor, staining, and discoloration due to bacteria, mold stains, or mildew stains return. Mattress pad and mattress ticking and upholstery composed of acetates, acrylics, cotton, fiberglass, nylon, polyethylene, polyolefin, polypropylene, rayon, silk, spandex, vinyl, wool, and fiberfill to be used in upholstery, sleeping bags, apparel where the fiber is cotton, natural down, nylon, rayon, or wool. SPRAY: Clean surface prior to application. Shake well. Using trigger pump sprayer, spray entire surface area 4”-6” from the surface making sure the surface is completely covered. Let stand until dry. If spotting occurs, wipe with moist cloth or sponge. Test for staining and color-fastness of fabric by treating and drying a small, concealed area prior to application. When applying to mattress pads and ticking do not soak. Remove children and pets from treated area until completely dried. If necessary, reapply every three months or when odor, staining, and discoloration due to bacteria, mold stains, or mildew stains return. STORAGE AND HANDLING: Non-refillable container. Do not reuse this container. Offer for recycling, if available. REVIEW LABEL FOR COMPLETE USAGE DETAILS. No, this is a blocker that helps prevent the growth of mold. How long will the blocker last? Up to three months, and won’t wash off with rain or washings. Does this product have bleach in it? Will the Mold Blocker work on fabrics? Yes, read the back label for directions on what types of fabrics to use it on. Test on an inconspicuous area of the fabric first to be sure it will not harm it. The “Directions for Use” are included to help you better understand our product. However, they do not provide you with all of the information needed to use the product safely and effectively. Prior to using any of our products, you should always read the entire label including all cautions. The contents of this website, such as text, graphics, images, and other material contained on this website ("Content") are for informational purposes only. Although Barr believes it to be accurate, we make no representation, warranty, or guarantee, and disclaim any liability with regard to the accuracy or completeness of the information, or the results of any action taken by anyone who relies on the Content. The Content is provided on an "as is" basis. Never disregard professional advice or delay in seeking it because of something you have read on this website. Reliance on any information provided by Barr, Barr employees, others appearing on this website is solely at your own risk. Always seek the advice of your physician or other qualified health provider with any questions you may have regarding a medical condition. If you think you may have a medical emergency, call your doctor or 911 immediately.